Sharp's PN-60SC5 is the latest of the industry-leading BIG PAD interactive displays to have 'Direct Optical Bonding' as standard for eye-catching image brilliance and a more immediate touch response. ‘Pen-on-Paper’, our most responsive touchscreen experience yet ensures users can be confident of extremely accurate touchscreen input and a natural writing sensation. Presentations are more composed, and meetings and lessons will all gain from next level interactivity, collaboration and engagement. 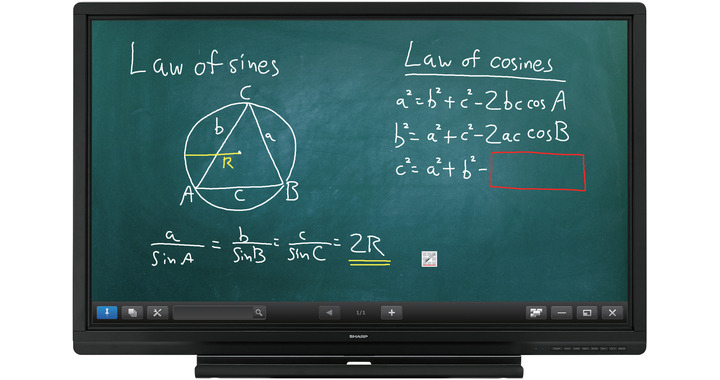 In the classroom, lecture theatre or office training rooms any teacher will appreciate the one-touch freeze frame and blackout buttons located on the front of the display for even more control and security. The freeze frame button allows vital content to be instantly held on screen whilst connected devices are free to continue working in privacy, without interrupting the audience or content being mirrored on the display. In addition, the blackout button instantly masks the screen, helping focus the audience or group's attention back to the presenter. In an office meeting room or the boardroom, any collaborative work group will immediately benefit from higher attention level and a more focused approach to discussion and decision making. The acclaimed 10-point Infrared (IR) touch from Sharp gives an amazingly fast and response touch experience, that generates user confidence, and ensures the BIG PAD is a natural tool and asset to the collaborative or training session - a new level of creative, productive and decisive effectiveness is achieved. Sharp’s application software for enhanced team communication and the capturing of all creative expression means that industry leading decisive and productive collaboration is achieved. The acclaimed, smart and intuitive SHARP Pen software, which runs on an external PC, opens up new ways for brainstorming, sharing ideas and finalising decisions. Using the BIG PAD can be made even better through using the SHARP Display Connect application to allow content sharing between mobile devices and the BIG PAD. Any training session or group meeting is enhanced when the audience can easily make a contribution from their connected devices. SHARP Touch Viewing application also offers an easy-to-use interface and file system to collect and organise data from different collaborative projects - an intuitive and powerful overview of data, to give the best possible conditions for effective decision making.